The Jungle Teacher: A Response to Royce Tan's "Maglish getting more mangled"
A Response to Royce Tan's "Maglish getting more mangled"
This is a response to "Manglish getting more mangled" by Royce Tan published in The Star on 21 January 2017. "Manglish getting more mangled" is one of those clickbait articles that makes my blood boil because it does not propose any kind of solution nor inspire any kind of action. Basically, it's a shame piece. Just the read the Facebook comments on this piece. You love that thick decadent slice of schadenfreude, don't you? How about a nice slap of reality? Articles like these exacerbate & legitimize our society's shaming of people with less than purrfect English. Honestly, Malaysians, if you really want English in Malaysia to improve, THIS KIND OF SHAMING HAS GOT TO STOP! If you're wondering what I'm ranting on about, here's an excerpt from the article. “Before you cross the strict, use your ase”. Understand that? Not likely, because even Manglish is getting mangled in Malaysia. “We in deed very conscent of student safety...” and “It is beyond our limit as it held at outside of campus”. The last two were excerpts from a press release from the student representative council of a local university. If local universities are that bad, one can figure that sentences churned out by secondary school students have left volunteer teachers horrified. What do you think will happen when students read this article & see sentences that very much resemble those of their own being publicly ridiculed in a national newspaper? Worse still, what if they come across it on Facebook & read the comments? I didn't really bother me much when we (Yes, WE need to take collective responsibility for our society's insatiable desire for blood.) English-shamed our deputy prime minister & our award-winning footballer. While the haters were hating, the minister & the footballer were laughing all the way to the bank. But, when you start targeting our students for shame, you're looking for trouble. It really manifests the keyboard warrior in me. Now, watch me dissect & critique this article. 1. No, Royce. Manglish is NOT getting mangled. You need to know something called interlanguage. Google it. The title of the article itself implies that users of English in Malaysia are disfiguring the English language. If you're still blur about the implications of the cleverly-crafted title, compare "Manglish getting more mangled" with alternative titles, like "Abysmal English Command in Malaysian Schools" or "English In Malaysia Must Improve". See the difference? So, who are the despicable actors of this "mangling"? The article then goes on to cite examples of English from a picture of a secondary school student's notebook and a picture of a press release from the student council of a local university. Wait, are these students really deliberately mangling English? Come on. The article then quotes representatives of non-profit organizations which are working on improving the low levels of English proficiency. However, instead of highlighting their good work and giving us useful examples of what we as readers can do to ameliorate, the quotes build upon the writer's hypothesis that the situation is dire for English language proficiency amongst Malaysian students. I'm getting really worked up about this newspaper article because (1) it doesn't tell us something we don't know (2) it builds hype & leaves the reader feeling helpless. Therefore, the foreseeable effects of this article will be (1) widespread sharing on social media due to the sentimentalization of the subject matter (2) used to incite ridicule of the national education system, teachers or students as readers will conflate the 2 bad examples with the rest of the students in Malaysian national schools & local colleges (3) it diminishes the noble work and important role played by the organisations quoted in the article. As English teachers, we should really be expecting second language learners to make mistakes. TRUTHFULLY, THE MORE MISTAKES THE BETTER! So, dear Royce, let me pick up your slack. I might as well demonstrate that the money spent on my education was worthwhile. I hope you're proud of me, Dr. Han. You don't need a degree to know that, in order to acquire a second language, students require lots & lots of input. We, Malaysians, are multilingual. It's common sense that we learn through lots of reading & listening (input). Our brains are unbelievable processing machines that make connections between different pieces of the input and our already existing knowledge of a language in general. These connections are used to construct this amazing language system called, an interlanguage. The interlanguage is a representation of what a second language is to the learner (grammar, vocabulary, phonology, etc). Over time and effort, the interlanguage grows, evolves, and becomes increasingly "native-like". 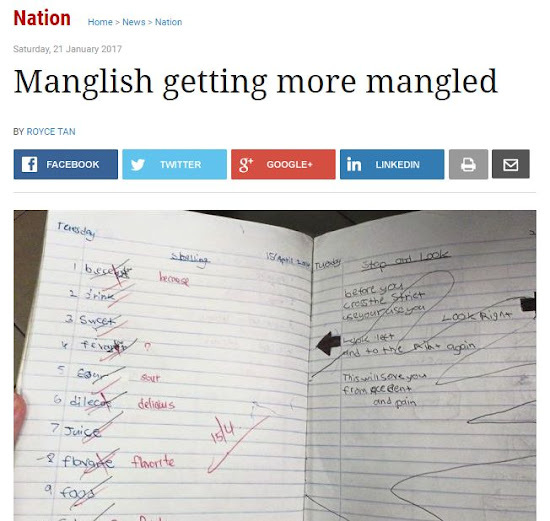 The examples of "mangled" English in the article are products of the respective learner's interlanguage. It's merely a reflection of what the learner has learned so far. It should never be a source of condemnation & shame for our already struggling learners. A teacher or even the learners themselves can use their errors as a foundation upon which further learning & improvement can take place. We should be celebrating the fact that they are willing to produce & use English, instead of citing their errors as examples of bastardized English. The article itself describes our low proficiency students as having low self-esteem when it comes to the use of English. Let's not exacerbate the situation by highlighting their mistakes, instead, we should cheer them on & provide them with the support they need to improve. One way of supporting them is investing your money, time or both to non-profit organizations like MY Readers, EduNation, LitMas, & Teach For Malaysia which were only briefly mentioned in the article, but worthy of exclusive features of their own. 3. Honestly, I don't think that we have a perfect education system. In fact, not even PISA topping Singapore. I wouldn't put my trust in our education system &, especially, not in the ivory tower bureaucrats who often stand in the way of actual education (by overemphasizing glitzy ceremonies, hollow programs, & evaluating students+teachers+schools via spreadsheets). I put my trust in the teachers on the ground. They are the ones laboring the fields & fighting in the trenches. They are educated intellectuals who are often treated like lembu. Additionally, I trust the students & their innate desire to better themselves. If they see us taking pleasure in demonizing writing that is very much similar to theirs, I fear that we will only be propagating the undesirable self-fulfilling prophecy we are trying to condemn, instead of propagating what we really really want. After all, we should water what we want to grow. So, if you are really concerned about manglish getting mangled, share this blog post LOL do what teachers have done for centuries: See a language mistake, privately contact the person & provide language support with kindness. You won't feel the endorphin rush from a "ridiculous" meme you've made going viral. But, you'll be able to sleep well at night knowing that you've made a difference in the life of one starfish.